With Hollywood’s abundant output of heist movies, potential future projects in this subgenre require much more than a clever procedural. There can only be so many laser security beams to maneuver, six-inch-thick steel doors to drill through, and impossible safes to crack. 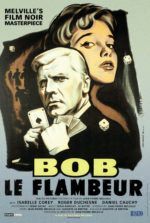 Audiences need interesting characters to guide their story, which is why movies like Rififi (made by the late Jules Dassin) and Ocean’s Eleven work so well—they flourish with high stakes, cheeky humor, or noirish suspense to guide them. 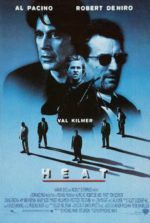 Run-of-the-mill heist films come along all-too-often (see, or rather don’t see, The Bank Job from a few weeks back), and now taste like a stale cracker compared to the sumptuous meals their betters represent. Flawless, the new film by director Michael Radford, his first since his 2004 adaptation of The Merchant of Venice with Al Pacino, twinkles with potential to reinvigorate the heist subgenre, but peters out in the last scenes. The setting places us in London circa 1960. 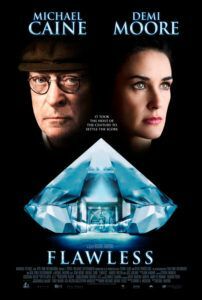 Inside the world’s largest supplier of diamonds, London Diamond Corporation, the first female manager, Laura Quinn (Demi Moore), finds herself pressed against a Glass Ceiling that will not crack. Her creative off-the-cuff thinking helps alleviate the company’s fraught contract with Russian buyers, but the Russians want the solution kept confidential within the executive staff, which prohibits Quinn from knowing about her own plan. Enter lowly night custodian Mr. Hobbs, played by the genial Michael Caine. Having overheard an executive meeting, he warns Quinn that she’s set for termination. And so, the hard-edged, underestimated woman employee, who’s been passed over for promotion after promotion but still remains the first to arrive and last to leave, finds herself listening to Mr. Hobbs’ proposal for revenge: rob London Diamond’s vaults of roughly one million in uncut stones, such a mere trifle of the company’s massive inventory that no one will even notice it’s gone. At first, she balks at the idea, but after examining her bleak situation, she sees likes possibility and agrees. 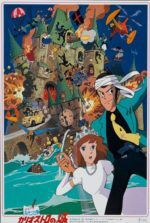 Filmed without big-budget swooshing camerawork or an over-emphatic musical score, this sleepy little heist movie leisurely draws you in, thanks to muted production design by Sophie Becher (from the 2004 remake of Alfie) and builds momentum that never feels forced. Attractive throwback costumes and outdated technology boast well for the 1960s mise-en-scène. This is before elaborate technology-based loss prevention measures challenged thieves (along with our imaginations). No infra-red sensors. No sound monitors. No motion detectors. Not even security cameras. That is, until well into planning their caper, Quinn learns London Diamond is (finally) installing monitoring equipment. Now their plan needs a change, requiring the elderly Mr. Hobbs to sprint down a long marble corridor, open the safe (to which he needs the combination), open it, and then get inside without being detected—all within the sixty-second window allotted by the rookie security system. However, all that suspense is squandered by a confused addendum addressing the blood diamond trade, thrown in seemingly just to avoid criticism for evading the subject altogether. First-time screenwriter Edward Anderson includes protestors outside of London Diamond early in the film, even the occasional mention of “slavery” regarding diamond harvesting; but such references are made in passing, with no bearing on any of the characters’ motives. Addressing this timely issue so casually seems like a missed opportunity to bring modern-day relevance to Radford’s 1960s period picture. Aside from her out-of-place British accent, being that her character is a noted American, (the possibly miscast) Demi Moore has a predictable presence as an early take-no-prisoners businesswoman, whose character doesn’t have any definition beyond that one-note label. Michael Caine’s humble janitor is curious, because with every glint in the actor’s eyes we see something profound; in his elder years, he always has that mischievous look about him—so much so that his position as “just a janitor” is improbable. One look at him and you know the wheels are turning. Flawless is calmly involving, insomuch that we would prefer our protagonists don’t get caught but aren’t caught up in the ordeal. Most of our attention focuses on the actors and how they flourish in their low-key roles. Caine is addictively watchable, his presence alone enough to make this film worth your time. But we’re never on the edge of our seat, the payoff doesn’t satisfy, and the entire procession feels arbitrary, if not wholly empty in the end. I can see a better director, someone with Hitchcockian airs (like Brian De Palma), bringing greater tension to the screen via clever cinematography. Alas, Radford’s tone does almost nothing to involve the viewer, leaving Moore and Caine, who both give fine performances here, to do all the work.